500 days without gas from Russia: $500-mn overpayment for “being European"
As Ukraine is “celebrating” 500 days without the Russian gas, local media disseminate statements by Naftogaz of Ukraine and Ukrtransgaz claiming that the country has been easily doing without Russian gas for nearly two years. These companies left posts on Facebook marking the 500th day without gas supplied from Russia. 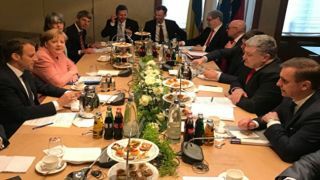 EADaily reported earlier that in late November 2015 Ukraine stopped purchasing gas directly from Gazprom and started doing it through European mediators. Even Naftogaz was reluctant to admit that fact earlier. Today, a reputable economist loyal to the current regime in Ukraine has confirmed that fact as well. “On April 10, it was the 500th day since Ukraine stopped purchasing gas from Russian Gazprom, though the reverse gas from Europe is still Russian,” Andriy Novak, Head of the Committee of Economists of Ukraine posted on Facebook. Dmitry Marunich, co-chair of the Energy Strategies Foundation, says refusing from direct gas supply from Russia, Ukraine’s authorities benefited just ideologically. “It should be noted that the supply sources of the country have been diversified. However, the gas supplied to Ukraine is mostly Russian, which once again confirms dependence of Eastern Europe. Besides, diversification implies reduction of the price. In fact, they overpay for the same gas from Russia that is supplied via Europe as a reserve flow. During nearly two years, Ukraine has paid about $500 million for the reverse gas,” the expert says. For consumers, the overpayment for the Russian gas results in price hikes. During the last three years alone, gas price for the population of Ukraine has increased 8-fold to 6,879 hryvnias ($254) per 1,000 cu m of gas. According to Ukraine’s state statistics, the population’s debts for gas have reached $370 million by March. Andriy Novak insists that the key reason behind Ukraine’s refusal from purchasing gas from Gazprom was not to let Russia blackmail Ukraine any longer with the gas price and halting supplies. Gazprom in turn adheres to the contract terms of 2009 and demands their implementation. Besides, Head of Naftogaz of Ukraine Andrey Kobolev said his company is ready to import the Russian gas, but it demands written guarantees that Gazprom will not apply the rule “take or pay” that binds Ukraine to import definite volumes of gas. “Moscow refused and this, but not the threat of blackmailing, became the true reason why Ukraine does not import gas directly from Gazprom. Last year and in the current year too, Gazprom offered gas for the lowest price. Besides, Gazprom was ready to abandon the rule ‘take or pay’ but not add it as an appendix to the contract. Since Gazprom and Naftogaz are litigating a controversy in Stockholm, Kiev admits that such situation may affect the positions of the Ukrainian company, so it refused to buy gas directly from Russia. This reason is mentioned in official documentation,” Dmitry Marunich says. Naftogaz of Ukraine and Gazprom filed claims against each other at the Stockholm Arbitration Court over their contract dating back to 2009. Naftogaz wants Gazprom to revise the contract, to make the price fair and to revoke the take or pay rule. It also claims compensation for reduced transit. According to Yuri Vitrenko, Commercial Director of the Ukrainian company, Naftogaz’ money claim totals $29 billion. Gazprom, in turn, claims money for the gas Naftogaz has refused to take since 2012 and the debts it does not own – a total of $50 billion. Ukraine says the debts may be increased to $80 billion. Earlier this March, Yuri Vitrenko said Naftogaz will turn bankrupt if it fails to win the proceedings.